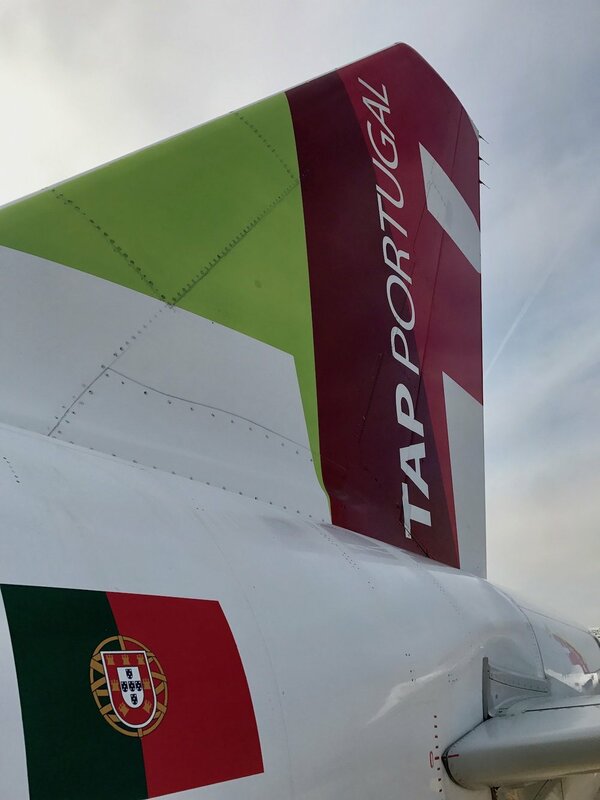 TAP Portugal, its country's national flag carrier, flies sixty-some mainline jets (all Airbus) and seventeen "express" regional jets and propeller aircraft from its hub in Lisbon throughout Europe, Africa, North and South America. We're immensely pro-you-visiting-Portugal, but you've otherwise likely been tempted by their often-great airfare if you're one who flies to, from, and within Europe. They're particularly relevant if you fly United Airlines, Lufthansa, Air Canada, SAS, and any of the other Star Alliance member airlines because you might find yourself on a TAP flight through Portugal en route to where you're going. Consider this review of our recent Lisbon to London experience. TAP Portugal is a compelling option for reasonably priced airfare on a reputable national flag carrier. Lisbon airport is bright, clean, and easy to get to... but is a hassle when it comes to people movement. The boarding process is woefully bad, at least on this specific flight from Lisbon to London. The crew didn't do themselves any favors by saddling Meghan as the sole caregiver to an unaccompanied minor, and forcing me through passport control to retrieve a bag that I should have just been allowed to carry on. Getting there is easy. Checking in and dealing with your luggage is a zoo. Everything is clean, bright, and modern once you're past the entry hall. The ANA Airport Lounge in Terminal 1 is accessible with Priority Pass Select membership, is comfortable, and offers decent food / wine with nice view. Everything about the movement of people through this airport is perplexing. Allow particular extra time for the customs zoo between lounge and gate. Passport control lies between the airside terminal, i.e. after you've cleared security, and your gate. But wait, you might ask, Britain hasn't Brexited yet, so why passport control? That's another story for another time, but suffice it to say, it is irrelevant here that both the UK and Portugal are EU members because the UK is not inside the Schengen Area, which means that flying from Lisbon to London effectively takes you out of the near-borderless-bubble and forces you to clear customs, which is -- as we've established -- an absolute zoo (yes, I've thrice used the word "zoo" in this piece). As an absolute last resort, should you be in danger of missing your flight, walk around the line and ask the agent directing traffic in the front if you can skip ahead. This is not to be counted on, so we recommend planning for an hour of this line just in case. So far none of this bizarre experience is TAP's fault, nor is (do we think) the strange order of operations at the gate. We scanned our tickets and proceeded down the jetway as you'd expect, but then suddenly found ourselves outdoors shuffling onto a bus. We found this turn of events odd, but our hunch is that because the UK is outside the Schengen, flights to it must depart from the the airport's international terminal, which is built for big wide-body long-haul planes. Because LIS-LHR is only about the distance from Washington, DC to Kansas City (a flight that often scores you a lowly commuter jet), it just doesn't make sense to fly a wide-body on this route. This puts TAP in the odd position of having a plane that is too small for the gate hardware, but that can't relocate to an appropriately sized gate. This is 100% speculation on our part, but there we were, on the tarmac traipsing up two sets of Arrested Development style air stairs... one at the front of the plane, and one at the back. The side effect is that boarding goes from orderly to a circus very quickly. One bus loaded passengers up the stairs from the front of the plane, the other from the back. Unfortunately, passengers weren't sorted onto the buses by seat assignment, meaning that some going up the front stairs had to go all the way to the back, and some up the back stairs had to go all the way to the front. I've never seen so many people walking over each other in a narrow aisle before. In the midst of all this, I was given a luggage tag and told I needed to leave my international size carry on at the bottom of the stairs for gate check. Hooray! Once aboard, I found the typical 3x3 seat configuration to offer limited legroom in otherwise comfy chairs relative to other economy classes, with what felt like a little extra recline. Uneventful once situated. Meghan and I were on different tickets so had become separated by seat assignments (sometime we should discuss her Lisbon to London to DC to Nashville itinerary). I had no issue with the crew, but Meghan was seated in the middle seat next to a child traveling alone as an unaccompanied minor. The cabin crew made no effort here, which forced Meghan to spent three hours caring for a child who she didn't know, who spoke no English, and who was absolutely forgotten by the crew of an airline to which (we looked this up later) the child's guardians had paid at least €50 for the privilege of having him travel. Eventually I stepped off the plane and into the jetway at Heathrow, where I learned that TAP's definition of "gate checking" a suitcase means they throw it into the mix of all the other bags whose final destination is the baggage carousel. They don't simply bring you your bag at the gate as I had been promised when I'd parted with it. Word to the wise here, then, that you prevent TAP from gate checking your bag at all cost. If you're connecting, you suddenly find yourself in the position of having to clear passport control to get to your baggage claim, then having to go back through passport control to get to your connecting flight. Nightmare. Bottom line? This was a bad, but not a nightmarish experience. It could have easily been a nightmare, but with some procedural tweaking TAP could have turned it into not a bad experience either. We'll fly them again for a second opinion, but will proceed with caution and some extra time in our schedule should we have a repeat of this experience.